Croatian art describes the visual arts in Croatia from medieval times to the present. In Early Middle Ages, Croatia was important centre for art and architecture in south eastern Europe. There were many Croatian artists during the Medieval periods, and the arts flourished during the Renaissance. Later styles in Croatia included Baroque and Rococo. Ancient monuments from Palaeolithic are very poor and it consists out of simple stone and bone objects. Some of the earliest remaining historical features include 100,000 year old bones of a Neanderthal man near Krapina (Krapina-Zagorje County ). Starčević culture (Pannonian culture named after its founder archaeologist Starčević) had characteristically fine red and ochre ceramics. Istrian culture (named after peninsula Istria in Croatia) which characteristic is stone houses (Bunja) without any type of bounding material, natively called dry-wall building (suhozid). These types of houses have staid in use until 19th century for shepherds.Sopot culture and Korenovo culture (named after towns of Sopot and Korenovo in Slavonia ) with original ceramic pots decorated with flat parallel lines, curves or v-shaped cuts.Danilo culture (found on Adriatic coast and islands) was rich with fine dark ceramics decorated with engraved geometrical motifs, spirals and meanders. Out of this culture sprung Hvar culture (after large island of Hvar) that is linked with Neolithic Greek cultures.We should also mention Neolithic excavation sites in Ščitarjevo near Zagreb , Nakovanj on the Pelješac peninsula and elsewhere. The most interesting Copper Age or Eneolithic finds are from Vučedol culture (named after Vučedol near Vukovar ). Ceramics are of extraordinaire quality with black color, high glow and specific decorative geometrical cuts that were incrust with white, red or yellow color. 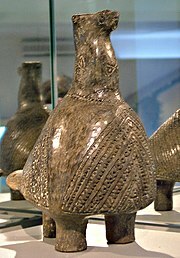 Sculptures are few, but very skilfully done and very expressive (like pot in shape of Dove with engraved double axe – labrys). People were living on hilltops with palisade walls. Houses were half buried, mostly square or circular (they were also combined in mushroom shape), with floor of burned clay and circular fireplace.Out of that culture sprung out Bronze Age Vinkovci culture (named after city of Vinkovci ) that is recognizable by bronze fibulas that were replacing objects like needles and buttons. Bronze culture of Illyrians, ethnic group with distinct culture and art form started to organize itself on today’s Croatia, Bosnia and Herzegovina. From 7th century BC bronze is replaced by iron, and only jewellery and art objects were still made out of bronze. Illyrian tribes, under the influence of Halstat cultures from north, form their regional centers that were slightly different.Very important role in their life was the cult of the dead, which is seen in their careful burials and burial ceremonies, as well as richness of the burial cites. In northern parts there was long tradition of cremation and burial in shallow graves, while in the south the dead are buried in large stone, or earth tumuli (natively called – gromile).Japod tribes have had affinity for decoration with heavy, oversized necklaces out of yellow, blue or white glass paste, and large bronze fibulas, as well as spiral bracelets, diadems and helmets made out of bronze. Small sculptures out of jade in form of archaic Ionian plastic are also characteristically Japodian. Numerous monumental sculptures are preserved, as well as walls of citadel Nezakcij near Pula , one of numerous Istrian cities from Iron Age. In 4th century BC first outbreak of Celts is recorded; they have brought technique of pottery wheel, new types of fibulas and different bronze and iron belts. They only passed on their way to Greece , so their influence in Slavonia, Istria and Dalmatia is negligible. In delta of Neretva on the south there was important influence of Hellenistic Illyrian tribe of Daors.Illyrians even conquered Greek colonies on Dalmatian islands. Famous is the queen Teuta of Issa (today island of Vis ) which waged wars with Romans. But finally, Romans subdued Illyrians in first century BC, and after that the history of these parts is a history of Illyrian provinces of Rome and Byzantium. Greek sailors and merchants have reached almost every part of Mediterranean and so on the shores of today’s Croatia. Greeks from Syracuse in Sicily in 390 BC came to islands of Vis (Issa), Hvar (Pharos) and Korčula (Corcyra Nigra) and there have founded city-states in which they lived quite isolated. Trade cities on Adriatic shores as Tragurion (today Trogir ), Salona (Solin near Split ), Epetion (today Stobreč ), Issa (Vis), were geometrically shaped and had villas, harbours, public buildings, temples and theatres. Pharos and Issa were strong Greek centers that showed their independence with their own money and marital fleet. Unfortunately, beside painted pots and ceramic tanagra sculptures, there are only few materials founding of this culture. One of those is: Croatian Apoxyomenos, Bronze head of goddess Artemis from Issa, 4th century BC; and stone relief of Kairos (god of happy moment) - from Tragurion, 3rd century BC, associated to famous Greek sculptor Lysippos.While the Greek colonies were flourishing on the island, on the continent the Illyrians were organizing their centers. Their art was greatly influenced by Greek art, and they have even copied some. Romans subdued Greek colonial cities in 3rd century BC. They have imposed organization based on military-economical system. Further more, Romans subdued Illyrians in first century BC and organized the entire coastal territory by transforming citadels to urban cities. After that the history of these parts is a history of Illyrian provinces of Roman Empire. Numerous rustically villas, and new urban settlements (the most impressive are Verige in Brijuni , Pula and Trogir - formerly Tragurion) demonstrate high level of roman urbanization. There have been at least thirty urban cities in Istria , Liburnia and Dalmatia with roman citizenship (civitas). The best-preserved nets of roman streets (decumanus/cardo) are those in Epetion (Poreč) and Jader (Zadar ). The most entirely preserved roman monuments are in Pola (Pula ); founded in first century dedicated to Julius Caesar, it is full with classical roman art as: stonewalls, two city gates, two temples on Forum, and remains of two theatres, as well as the Arch from year 30 AD, and the temple of August build in years 2 to 14 AD, and finally the Fluvian Amphitheatre (so called – Arena) from 2nd century. In 3rd century AD the city of Salona becomes the largest (it had 40 000 inhabitants) and most important city of Dalmatia. Near the city emperor Diocletian, born in Salona, build the Palace (around year 300 AD), which is largest and most important monument of late antique architecture in the World. On its pathways, cellar, domes, mausoleums, arcade and courtyards we can trace numerous different art influences from the entire Empire. Sculptures that we inherited are ones like: the head of a boy, girl and a woman from Salona, monumental figure of Minerva from Varaždin , the head of Hercules from Sinj, sculptures of roman emperors from Nin and Vid near Metković , damaged sculpture of emperor in Zagreb Museum etc. In the 4th century Salona became the center of Christianity for entire western Balkans. It had numerous basilicas and necropolises, and even two saints: Domnius (Duje) and Anastasius (Staš). One of few preserved basilicas in western Europe (beside ones in Ravenna ) from the time of early Byzantium is Euphrasian Basilica in Poreč from 6th century. The early Middle Ages brought the great migration of the Slavs and this period was perhaps a Dark Age in the cultural sense until the successful formation of the Slavic states which coexisted with Italic cities that remained on the coast, each of them were modelled like Venice . The term Middle Ages, in Western Europe, designates the period following the decline of the Roman Empire through the thirteenth century. Early Middle Ages (Pre-Romanesque) covers the time from seventh to the end of the tenth century.In the 7th century the Croats, with other Slavs and Avars, came from Northern Europe to the region where they live today . They were on the level of Iron Age nomadic culture, so they did not know how to enjoy the advantages of urban cities. That’s why they first inhabited city boundaries on close by rivers (like Jadro near roman Salona). The Croats were open to roman art and culture, and first of all to Christianity. First churches were build as royal sanctuaries, and influences of roman art was strongest in Dalmatia where urbanization was thickest, and there was largest number of monuments. Gradually that influence was neglected and certain simplification, alteration of inherited forms and even creation of original buildings appeared. All of them (dozen large ones and hundred of small ones) were build with roughly cut stone (natively called – lomljenac) bounded with thick layer of "malter" from outside.Large churches are longitudinal with one or three naves like the Church of Holy Salvation on spring of river Cetina and the Church of Saint Cross near Nin, both built in the 9th century. The latter has strong semi-circular buttresses that give a feeling of fortification, emphasized with mighty bell-tower positioned in front of the entrance. Smaller churches are interestingly shaped (mainly central) with several apses. The largest and most complicated central based church from 9th century is St Donatus in Zadar . Around its circular centre – with dome above – is nave in shape of ring with three apses directed to east; that shape is followed on second floor forming a gallery. From those times, with its size and beauty we can only compare the chapel of Charlemagne in Aachen . Altar fence and windows of those churches were highly decorated with transparent shallow string-like ornament that is called pleter (commonly embraced as "Croatian wattle", meaning to weed) because the strings were threaded and rethreaded through itself. Motifs of those reliefs were taken from roman art (waves, three-string interlace, pentagrams, net of rhomboids etc. ), but while in roman art they only made frame of a sculpture in Dark Ages it fills entire surface. Those reliefs were vividly coloured (red, blue and yellow), and because the paintings from that period are not preserved (we know the existed because they were mentioned in written sources as liturgical from Split, 8-11th century), they remain the only remains of old-Croatian painting. Sometimes the figures from Bible appeared alongside this decoration, like relief in Holy Nedjeljica in Zadar, and then they were subdued by their pattern. That happened to engravings in early Croatian script – Glagolitic. Soon, the "glagolic" writings were replaced with Latin on altar fences and architraves of old-Croatian churches. Those inscriptions usually mention to whom the church was dedicated, who build it and when it was build, as well who produced the building. That was the way that “barbarian newcomers” could fit amongst the Romanised natives. From Crown Church of King Zvonimir (so called Hollow Church in Solin) comes the altar board with figure of Croatian King on the throne with Carolingian crown, servant by his side and subject bowed to the king. Linear cuts representing lines on the robes are similar to lines on their frontal faces, and also on those of a frame. Today the board is a part of Split cathedral baptistery. Out of artistically applied objects there are many reliquaries preserved . They were adored and believed to have magical powers of healing. They were usually shaped as the part of body that was in them. That’s why the relic of Saint James's head in Zadar is shaped in form of a head; the tube part has section with stream of arcades with single saint in every one, while a dome-like cover is decorated with medallions bearing symbols of evangelist and Christ on the top. Early Romanesque art appeared in Croatia at the beginning of 11th century with strong development of monasteries and reform of the church. In that period many valuable monuments and artefacts were made. We can find them mainly allocated alongside Croatian coast and nearby lands: Istria, Dalmatia, and Primorje; while artefacts and monuments from Croatian north are scarce.In 11th century the monumental cities were built along the entire Dalmatian coast. Houses were out of stone, on ground floor there were shops or dinners (natively – konoba) like in cities as: Poreč , Rab , Zadar , Trogir and Split .In them the most important buildings were churches. They were commonly stone-built basilicas with three naves, three apses, columns, arches, arcades and wooden roofs; build near monasteries of Benedictian monks who came out of Italy. St. Peter in Supetarska Draga on island of Rab (11th century) is best-preserved church of that type in Croatia. On the same island is Cathedral of Rab (12th century) that has high-Romanesque bell tower, largest in Dalmatia. It is specific with its openings, which are multiplied as we go higher floor by floor (Latin: mono-fore, bi-fore, tri-fore, quadro-fore); typical for Romanesque, but also architecturally smart because it makes every next floor a bit lighter than the preceding one. Cathedral of St. Anastasia, Zadar (natively - St. Stošija) in Zadar (13th century) is marked outside by a string of blind arch-niche on both sides and on frontal side where it also has two Rose windows with radial columns and three portals. Inside it has three naves, slim columns that are supporting a gallery, and flat figurative reliefs. In Croatian Romanesque sculpture we have a transformation of decorative interlace relief (natively – pleter) to figurative, which is found on stone ceilings. At the end of Romanesque period, in Istria there were workshops of monumental figures. They had geometrical and naturalistic features reminiscent of gothic.The best examples of Romanesque sculpture are: wooden doors of Split cathedral done by Andrija Buvina (c.1220) and Stone portal of Trogir cathedral done by artisan Radovan (c. 1240). Main portal of Trogir cathedral, done by artisan Radovan, is the greatest and the most important monument of medieval sculpture, not only in Croatia but also in all Balkans. It consists out of four parts: surrounding, on door jamb, are naked sculptures of Adam and Eve on both sides, carried by lions; and inside are numerous reliefs with every-day scenes organized in monthly calendar, and scenes from hunting; and finally in the middle are scenes from the life of Christ: from Annunciation to Resurrection – positioned in arches around tympanum. Finally, in tympanum is the Birth of Christ. The way the figures are formed is very realistic, calling on new gothic humanism, on the trail of the highest achievements of French sculpture (of that in Chartres ). Radovan is oriented toward human counterpart in art; best seen in selection of main scene in the tympanum – instead of usual Romanesque motif of Last Judgement he had chosen The Nativity. Romanesque painting is on walls, on board and in books – illumination. Early frescoes are numerous and best preserved in Istria. On them we can evidence the mixing of influences of Eastern and Western Europe, for example: flat, linear drapes and round red circles on their cheeks.Paintings on board are usually Madonna with Child and painted Crucifixions. The oldest miniature are from 13th century – Evangelical book from Split and Trogir. Gothic art in 14th century was supported by culture of cities councils, preaching orders (like Franciscans), and knightly culture. It was the golden age of free Dalmatian cities that were trading with Croatian feudal nobility in the continent. Urban organization and evolution of Dalmatian cities we can follow through developing and expanding of Rab and Trogir , regulation of streets in Dubrovnik and integration of Split . It is also a time of paving the streets with stone, sewage canals and communalities.Largest urban project of those times was complete building of two new towns – Small and Large Ston , and about a kilometre of wall with guard towers between them (14th century). After Hadrian's wall in Scotland , the longest wall in Europe. That way all of Pelješac peninsula was surrounded and protected from land shore whit aim to protect the most valuable possession of Republic of Dubrovnik – salt from Ston. We can recognize Gothic fortification with its high towers in shape of square prism from simple Romanesque one, or round Renaissance one. The best-preserved ones in Croatia are in Istria (Hum , Bale , Motovun , Labin etc) and those on north (Medvedgrad above Zagreb from year 1260) or on the south Sokolac in Lika (14th century). Franciscan church in Pula (1285) is the most representative example of Early Gothic. Simple one nave building with wooden rib-vault ceiling, with square apse and high stain windows was built from 13th to 15th century. Tatars destroyed Romanesque cathedral in Zagreb during their scourge in 1240, but right after their departure Zagreb got the title of a free city from Hungarian king Bela IV. Soon after bishop Timotej began to rebuild the cathedral in new Gothic style. Building with three naves, polygonal apses and rib-vault had Romanesque round towers. The naves were built in 14th century, and the vault was finished in 15th. With the arrival of Turks in 16th century high walls and towers surrounded it. Only one tower was finished in 17th century, while in 18th the Baroque roof became the landmark of entire city. With the restoration in 19th century in Neo-gothic style it lost former harmony. During the 14th century, the Split cathedral of St Duje and cloister of Franciscan monastery in Dubrovnik were also build. Gothic sculpture is represented by already mentioned Radovan’s Portal in Trogir .The Church of St Mark in Zagreb was built in 14th and 15th century in Late Gothic style. In that manner was also the main portal with portraits of St Mark, Christ, Madonna and 12 apostles with slightly rounded heads and softly drapes on their clothes. Originally the entire portal was vividly coloured as we can see by the remains of colours on wooden figures. those days, Zadar was an independent Venetian city. The most beautiful examples of gothic humanism in Zadar are reliefs in gilded metal as in Arc of St Simon by artisan from Milan in 1380. On the arc, by the scenes of saints’ life (finding of the body in monastery’s cluster, saving the ship in storm etc.) there are historical ones as entering of Hungarian king Ludovik in Zadar or the oat of his wife Jelena Kotromanić of Bosnia over the saints’ grave. Gothic painting is less preserved, and finest works are in Istria as fresco-cycle of Vincent from Kastv in Church of Holy Mary in Škriljinah near Beram, from 1474. Characters are tangible, three-dimensional in illusion of space. By the scenes from the life of Christ there is also The March of the Dead (The Dance of Death), which is humanistic, late gothic theme, very popular in Renaissance. Paolo Veneziano was the greatest painter of the Adriatic in the 14th century. His works were mixture of Byzantine iconography and gothic idealisation. He worked on the icons in Krk, Rab, Zadar, and Trogir. In Dubrovnik he has done a masterpiece - Dubrovnik Crucifixion. From that times are the two of the best and most decorated illuminated liturgies done by monks from Split, – Hvals’ Zbornik (today in Zagreb) and Misal of Bosnian duke Hrvoje Vukčić Hrvatinić (now in Istanbul ). In 15th century, Croatia was divided between three states – northern Croatia was a part of Austrian Empire , Dalmatia was under the rule of Venetian Republic (with exception of Dubrovnik ) and Slavonia was under Ottoman occupation.Dalmatia was on the periphery of several influences, just as far from Italy as from Ottomans in Bosnia and Austrians in the north, so it thrived from all. In those circumstances in Dalmatia flourished religious and public architecture with clear influence of Italian renaissance, but still original. Three works out of that period are of European importance, and will contribute to further development of Renaissance: Cathedral of St James in Šibenik, Chapel of Blessed John in Trogir, and Sorkočević’s villa in Dubrovnik. Only in the kind of environment, free of dogmas and self-governed - far of major governing centers, could it be possible for artisan known as Juraj Dalmatinac to build a church entirely by his own project – Cathedral of St. James in Šibenik , in 1441. Besides mixing of gothic and renaissance style it was also original by unity of stone building and montage construction (big stone blocks, pilasters and ribs were bounded with joints and slots on them - without concrete) in the way that was usual in wooden constructions. This was unique building with so-called three-leaf frontal and half-barrel vaults, first in Europe. The cathedral and its original stone dome was finished by Nikola Firentinac following the original plans of Juraj.On the cathedral there is a coronal of 72 sculpture portraits on the outside wall of the apses. Juraj himself did 40 of them, and all are unique with original characteristics on their faces. on Šibenik cathedral inspired Nicola for his work on the expansion of chapel of Blessed John from Trogir in 1468. Just like Šibenik cathedral, it was composed out of large stone blocks with extreme precision. In cooperation with disciple of Juraj – Andrija Aleši, Nicola has achieved unique harmony of architecture and sculpture according to antique ideals. From inside, there is no flat wall. In the middle of chapel, on the altar, lays the sarcophagus of blessed John of Trogir. Surrounding are reliefs of puttos carrying torches that look like they were peeping out of doors of Underworld. Above them there are niches with sculptures of Christ and apostles, amongst them are putties, circular windows encircled with fruit garland, and a relief of Nativity. All is ceiled with coffered ceiling with image of God in the middle and 96 portrait heads of angels. With so many faces of smiling children the chapel looks very cheerful and there isn’t anything similar in European art of that time. In the entire area of Republic of Dubrovnik there were numerous villas of nobility, unique by their functionality and space organization - combination of renaissance villa and government building. Sorkočević’s villa in Lapad near Dubrovnik in 1521 is original by order of building parts in asymmetrical, dynamical balance. Wordiest Croatian renaissance sculptures are linked to some architecture, and the most beautiful one is perhaps relief Flagellation of Christ by Juraj Dalmatinac on altar of St Staš in Split cathedral. Three almost naked figures are caught in vibrant movement. The most important Croatian renaissance painters are from Dubrovnik: Lovro Dobričević, Mihajlo Hamzić and Nikola Božidarević. They painted the altar screens with first hints of portraits in characters, linear perspective and even still life motifsIn north western Croatia, the beginning of the wars with the Ottoman Empire caused many problems but in the long term it both reinforced the northern influence (by having the Austrians as the rulers).With permanent danger by Ottomans from east, there was modest influence of renaissance, while fortifications thrived. The plan for fortified city of Karlovac in 1579 was first entirely new urban city to be built by renaissance plans (so called “ideal city” plan) in Europe. It was built in radial plan, later common in Baroque.Renaissance fort of Ratkay family in Veliki Tabor from 16th century has mixed features of gothic architecture (high roofs) and renaissance (cluster and round towers) making it an example of mannerism. Some of the famous Croatian renaissance artists lived and worked in other countries, like brothers Laurana (natively - Vranjanin, Franjo and Luka), miniaturist Juraj Klović (also known as Giulio Clovio) and famous mannerist painter Andrija Medulić (teacher of El Greco). In 17th and 18th century Croatia was reunited with the parts of country that were occupied by Venetian Republic and Ottoman Empire. The unity attributed to sudden flourishing of Art in every segment.In northern Croatia and Slavonia sprung out numerous and worthy works of baroque art – from urban plans and large forts to churches, palaces, public buildings and monuments, all were done in Baroque style. Large fortifications with radial plan, ditches and numerous towers were built because of constant Ottoman threat. The two largest ones were Osijek and Slavonski Brod . Later they become large cities. They were fortified with water and earth – earth mounds with cannons and canals filled with water that was supposed to slow dawn the approaching enemies.The fort of Slavonski Brod was the largest in all Croatia, and one of the largest ones in entire Europe because it was bounding fort of Europe toward Ottoman Empire. Urban planning of Baroque is felt in numerous new towns like Karlovac , Bjelovar , Koprivnica , Virovitica etc. that had large straight streets, rectangular squares in the middle surrounded with buildings as government and military ones as well as representative church. Cities of Dalmatia also got baroque towers and bastions incorporated in their old walls, like the ones in Pula , Šibenik or Hvar . But biggest baroque undertaking happened in Dubrovnik in 17th century after catastrophic earthquake in 1667 when almost entire city was destroyed. In Baroque style were rebuilt the church of St Vlaho on the main square (1715), Main Cathedral and Jesuit monastery with church of St Ignatius. Paolo Passalaqua united several of those baroque masterpieces with his Jesuit Stairway. That beautiful wide stone stairway with series of convexities and concavities and strong balustrade (reminiscent of famous Spain Stairway Square in Rome ) actually connected two separate baroque parts of the city - the Jesuit church above and Ivan Gundulić Square below. During the Baroque numerous churches, enchanting us with their size and form were built in all Croatia, thus becoming a crown in every town or a city.The monastery churches often had an enclosing wall with inner porches lavishly decorated, like in Franciscan monastery in Slavonski Brod where the columns are as thick as baroque abundance.The most beautiful one is probably the church in Selima near Sisak . It has oval shape with elliptic dome and concave and convex front with two according towers. But most luxuriant is church of Maria of the Snow in Belec from 1740 with entire interior filled with lively gilded wooden sculptures, frescoes of painter Ivan Ranger from Austria . Ranger was classic Rococo painter whose characters were softly painted in graceful positions and optimism of cheerful colors. He also lavishly painted the gothic church in Lepoglava, and ceiling of Banqueting Hall of Bistra Palace (one of most beautiful elliptic plans in profane architecture). Wall painting experienced flourishing in all parts of Croatia, from illusionist frescoes in church of Holy Mary in Samobor , St Catherine in Zagreb to Jesuit church in Dubrovnik. Best preserved ones are Rococo frescoes in Miljana mansion where allegorical seasons and natural elements were depicted through human nature and his reflection on art. An exchange of artists between Croatia and other parts of Europe happened. The most famous Croatian painter was Federiko Benković who worked almost his entire life in Italy, while an Italian – Francesco Robba, did the best Baroque sculptures in Croatia. His most beautiful and moving work is marble altar of Crucifixion in Church of Holy Cross in Križevci . Beside masterly carved body of Christ there is a theme of Abraham’s Sacrifice; it is diagonal composition in anxious tension with several movements of limbs and drapes. Austrian countries on the beginning of 19th century (to which Croatia belonged than) building in Classicistic Manner prevailed. In Croatia most prominent architect was Bartol Felbinger who also built City Hall in Samobor (1826) and Januševac Castle near Zagreb . Romantic movement in Croatia was sentimental, gentle and subtle – real image of bourgeoisie’s humble and modest virtues. In architecture there were simple decorations made of shallow arch like niches around windows, while the furniture was of mildly bended Biedermeier furniture, and even in dressing the cheaper materials with cheerful colors prevailed. So, it is no surprise that instead of representative portraits in Croatia miniature portraits are preferred. At the end of 19th century architect Hermann Bolle undertook one of the largest projects of European historicism – a half-kilometre long neo-renaissance arcade with twenty domes on Zagreb cemetery Mirogoj . the same time the cities in Croatia got important urban makeover. But whit size and importance the urban regulation of Downtown Zagreb (largely the work of Milan Lenuzzio, 1860-1880) is revolutionary. Between Zagreb’s longest street – Ilica, and new railway the new geometrical city was build with large public and social buildings like neo-renaissance building of Croatian Academy of Sciences and Arts (HAZU - learned society promoting language, culture, and science from its first conception in 1836; the juxtaposition of the words typically seen in English as "Arts and Sciences" is deliberate, F. Scmidt, 1884), neo-baroque Croatian National Theatre (HNK, H. Helmer and F. Fellner, 1895), and to that date very modern Art Pavilion (1898) with montage construction of steel and glass – Croatian “Crystal Palace ”, and finally the masterpiece of Art Nouveau – The National Library (Lubinski, finished in 1912). This urban plan is bounded with series of parks and parkways decorated with numerous fountains, sculptures, avenues and gardens (known as “Green Horseshoe”) making Zagreb one of first cities build according to new European art theory of “city as a work of art”. Pseudo building that emphasizes all three visual arts is former building of Ministry of Prayer and Education in Zagreb (H. Bolle, 1895). Alongside with rooms in Pompeii style and renaissance cabinet, the large neo-baroque “Golden Hall” was painted with historic compositions by Bela Čikoš-Sesija (The Baptism of Croats and Split Council), Oton Iveković (Meeting of Koloman and Croatian Nobility), Celestin Medović (The Arrival of Croats), Vlaho Bukovac (Frantz_Joseph (ctrl-click)">Frantz Joseph in Zagreb) and decorated with reliefs by Frangeš Mihanović. “The Golden Hall” becomes unified monument of its age, one of few in Europe. Realism appeared in bourgeois portraits by Vjekoslav Karas. The characters of his portraits are true expressions of their time.Realistic landscapes are linked to certain parts of the country – Slavonian forests by artists of Osijek school, Dubrovnik in works of Celestin Medović, and Dalmatian coast in works of Menci Klement Crnčić. In sculpture the hard realism (naturalism) of Ivan Rendić was replaced by art nouveau composed and moving reliefs by Frangeš Mihanović. Vlaho Bukovac brought the spirit of impressionism from Paris , and he strongly influenced the young artists (including the authors of “Golden Hall”). Right after he painted the screen in HNK in Zagreb with theme of Croatian Illyrian Movement, and symbolic portraits of Croatian Writers in National Library, he founded The Society of Croatian Artists (1897), so called "Zagreb’s colourful school". With this society the Croatian Modern Art started. On the Millennium Exhibition in Budapest they were able to set aside all other artistic options in Austro-Hungary. The oldest preserved relics of musical culture in Croatia are sacral in nature and represented by Latin medieval liturgical chant manuscripts (approximately one hundred musical codices and fragments dating from the 11th do the 15th centuries have been preserved to date). They reveal a wealth of various influences and liturgical traditions that converged in this region (Dalmatian liturgy in Benevento script, Northern Gregorian chant, and original Glagolihic chant). Early in the 15th century the ideas of Humanism in Croatia brought about changes to the world of music. Interest in music began to spread outside of monastic and church walls with growing influence of new spiritual tendencies from Central European and particularly Italian cities. Humanists and philosophers promulgated new musical theories and aesthetic ideas: Federik Grisogono, Pavao Skalić, Frane Petrić. The writing down of folk and popular music began in mid-sixteenth century: in the poem Fishing and Fishermen’s Talk from 1558, Petar Hektorović ingrained Neoplatonic ideals in popular music; and transcripts of Croatian musical folklore were printed in Venetian anthologies (Guilio Cesare Barbetta 1569, Marco Facoli 1588). Julije Skjavetić from Šibenik published his madrigal (Li madrigali a quattro, et a cinque voci 1562), while his Motetti a cinque et a sei voci, (1564) are characterised by a lavish polyphonic structure under the influence of the Dutch school. Music and dance were a component part of theatrical expression (Mavro Vetranović, Nikola Nalješković, Marin Držić, Marin Benetović), while the function of music and sound effects was under the influence of Italian pastorals. New tendencies of early Baroque monody soon found their way into the domestic musical tradition, both sacral and secular. Tomaso Cecchini, from Verona , who spent his entire working life (1603-44) as a choirmaster, organist and composer in Split and Hvar , published his madrigals Armonici concetti, libro primo (1612) as the oldest Baroque collection written for the Croatian milieu. The collection Sacrae cantiones (Venice 1620) by Ivan Lukačić from Šibenik is valuable testimony of sacral music that was performed in Split, and is generally speaking, one of the most significant monuments of old Croatian music altogether. The Franciscans and Paulists cultivated sacral chants, mostly monophonic and without organ accompaniment (the manuscript cantos of Frane Divnić, Bone Razmilović, Filip Vlahović- Kapušvarca, Franje Vukovarca and Petar Knežević). The tradition of the Baroque was more lasting in church/sacral music, which was the musical form that was systematically nurtured in numerous monasteries (especially Franciscan ones) as well as in parish and cathedral churches. The preservation of music manuscripts and prints became widespread practice in the mid-18th century. Simple vocal-instrumental music for two voices with organ continuo was the form most frequently performed in churches; more prominent individuals active in the sphere of music could be found only in larger urban centres. They were mostly organists and maestri di cappella, skilful composers who had small vocal and/or instrumental ensembles and who frequently acted as music teachers (private or in church schools). The gradual development of the middle class had as one of its consequences the corresponding secular organisation of musical life, particularly in the first decades of the 19th century, a period that saw the establishment of music ensembles, music societies (1827 in Zagreb , then in Varaždin , Rijeka , Osijek etc.) and music schools. In addition, public balls and other events were organised (music academies, theatre performances) with the participation of local and foreign musicians (from Italy , Austria , Bohemia etc.) including the private collection of music materials for playing music at home. Music became a component part of various festivities, such as the arrival of important political personalities (the new governor or the Habsburg king Frances I, etc. ), the feasts of patron saints (St. Blaise in Dubrovnik , St. Domnius in Split , St. Stephen in Hvar and Zagreb etc. ), for which so called art music was specifically composed, with the inclusion of popular elements (bourgeois dances, folk music of the peasantry). Many Italian and domestic musicians worked in Dubrovnik: in the cathedral choir and orchestra, in the duke's orchestra, at private and public festivities . An excellent early example of pre-classical symphony and chamber music was given by Luka Sorkočević, a nobleman educated in Rome, as well as his son Antun, a historian and diplomat. Ferdo Livadić (1799-1879) wrote Notturno in F-sharp minor for piano as early as 1822, which is, along with John Field's compositions under the same name, one of the earliest examples of that type of piano miniatures in general.In the course of the 1830', as a reflection of such tendencies in Europe, the Illyrian Movement emerged in Croatia which assigned not only to literature but to music as well a particular socio-political role: the forming and guarding of national awareness including the struggle against Hungarization and Germanization. Accordingly, in 1846 Josip Runjanin (1821-1878) put to music Antun Mihanović's poem Lijepa naša domovina (Our Beautiful Homeland), which later became and then remained the Croatian national anthem. In such a setting Vatroslav Lisinski (1819-1954) composed the first Croatian national opera Ljubav i zloba (Love and Malice), which premièred in Zagreb in 1846. Taking into consideration the presence of folk music, the aspirations of the Illyrians went far beyond the results achieved, something that is also continued in the work of Ivan Zajc (1832-1914) in the second half of the century. His masterpiece, the opera Nikola Šubić Zrinjski, ever since its opening night in Zagreb in 1876, had not lost in popularity, partly because its heroic patriotism functions as a symbol of Croatia's victory. Finally, owing to the founder of Croatian ethno-musicology and musical historiography, Franjo Kuhač (1834-1911), the systematic research of folklore evolved simultaneously with Zajc's endeavours. Finally it should be added that in Zajc's and Kuhač's era, major halls for musical performances and concerts were built: in Zagreb the building of the Croatian Music Institute (1876,1895) with a concert hall, and the building of the Croatian National Theatre (1895), including the theatre buildings in Rijeka (1885), Split (1893) and Osijek (1907) where, along with the Croatian National Theatre in Zagreb, drama, opera and ballet performances are still played today. During the 19th century, other instrumentalists and singers won international recognition, for example, the violinist Franjo Krežma (1862-1881), singers, among which Ilma Murska (1834-1889), Matilda Mallinger (1847-1920) who sang at the opening night of Wagner's Die Meistersinger von Nűrnberg in 1868, Milka Trnina (1863-1941) and Josip Kašman (1850-1925), the first Croatian singer to appear at the New York Metropolitan Opera.